Laie Hawaii Temple is a temple of The Church of Jesus Christ of Latter-day Saints (LDS Church) located on the northeast shore of the Hawaiian island of Oʻahu. The temple sits on a small hill, a half-mile from the Pacific Ocean, in the town of Lāʻie, 35 miles (56 km) from Honolulu. Along with Brigham Young University–Hawaii and the Polynesian Cultural Center, the Laie Hawaii Temple plays an important role in the town of Lā'ie, with the Visitors' Center attracting more than 100,000 people annually. In addition to initial building and construction, the temple has been dedicated for use by several presidents of the LDS Church. The temple site was dedicated by Joseph F. Smith on June 1, 1915, with Heber J. Grant dedicating the completed structure on November 27, 1919. Spencer W. Kimball rededicated the temple after significant expansion on June 13, 1978. Following seismic upgrades and remodeling, Thomas S. Monson rededicated the temple on November 21, 2010. The Laie Hawaii Temple was the first temple built by the LDS Church outside the contiguous United States. The temple is also the oldest to operate outside Utah, and the fifth-oldest LDS temple still in operation. 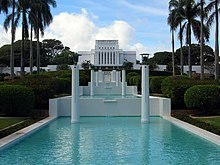 The Laie Hawaii Temple was formerly known as the Hawaiian Temple or the Hawaii Temple until the implementation of the standard naming convention for LDS temples. During the California Gold Rush, the first ten Mormon missionaries to Hawaii departed San Francisco on the ship Imaum of Muscat. After 20 days at sea, the ship arrived on December 12, 1850, in Honolulu Harbor at what was then known as the "Sandwich Islands" (Hawaiian Islands). A week later, nine missionaries received their assignments; two headed to the island of Kaua'i, three to Lahaina on the island of Maui, two to the Big Island of Hawaii, and two stayed behind in Honolulu. These nine missionaries formed the basis of the Sandwich Islands Mission. The first LDS Church congregation in Hawaii was established on the island of Maui in 1851. Missionaries settled on the island of Lānaʻi in 1854, and in Lāʻie on the island of Oʻahu in 1865. In 1865, the church purchased a 6,000-acre (2,400 ha) sugarcane plantation as a gathering place for the Latter-day Saints in the area. While on a mission to the Sandwich Islands, Joseph F. Smith first proposed building a temple in Hawaii during a meeting in Lāʻie on February 15, 1885. George Q. Cannon, one of the original ten missionaries, visited Lāʻie in 1900 and became revered as a prophet for promoting the idea of a new Hawaiian temple among his congregations. In 1915, Joseph F. Smith, then sixth president of the LDS Church, announced plans for the first temple outside the contiguous United States and chose Lāʻie for its construction. According to Mormon folklore, precious materials arrived just in time to complete the building of the temple: Temple builders ran out of wood (a scarce commodity on the islands) during initial construction, but local members received lumber when a ship ran aground and needed to unload some of its cargo of wood. The temple builders volunteered to help the ship and were given the lumber out of gratitude. The lumber taken from the ship proved to be just enough to finish the temple. When news of the new Laie Hawaii Temple reached Native Hawaiian converts (and other Polynesians) living far from home in the town of Iosepa, Utah, many decided to emigrate back to Hawaii. Although the Hawaiians had lived in Iosepa since 1889, the closest temple, Salt Lake Temple, was 75 miles away from the colony. Moving to Laie gave the Hawaiians the ability to be closer to the new temple and allowed them to perform sacred ordinances without having to travel great distances. By January 1917, most of the Hawaiians returned home, leaving Iosepa a ghost town. LDS Church president Heber J. Grant presided over the Hawaiian Temple's dedication on November 27, 1919. Grant called the Hawaiian people "descendants of Lehi" (a prophet in the Book of Mormon), and saw the future of the new temple in Lāʻie as a magnet for Polynesian converts. After the temple was completed, more Polynesians moved to Lāʻie, to participate in temple ordinances. Tourists were also drawn to the area, and guide books of the time compared the Lāʻie temple to the Taj Mahal. The 1941 attack on Pearl Harbor gave rise to another popular tale about the Laie Hawaii Temple in Mormon folklore. According to variations on this story, Japanese aircraft pilots attempted to bomb or strafe the Hawaiian Temple just prior to, or just after, the attack, but were thwarted by mechanical failure or from an unseen protective force. Some stories suggest that the Japanese pilot who attempted to attack the temple was converted to the LDS Church after he saw a picture of the temple in the possession of Mormon missionaries in Japan. Although there is an eyewitness who believes he saw the attempted bombing and a former missionary who says he met the Japanese convert, historians have found little supporting evidence that would substantiate these stories. Beginning in May 1976, the temple was closed for a two-year remodeling project, expanding from 10,500 square feet (980 m2) to over 47,000 square feet (4,400 m2). Church president Spencer W. Kimball rededicated the temple on June 13, 1978. A $5.5 million renovation, renewal, and beautification project along Hale Laʻa Boulevard leading to the temple began in 2003, lasting 14 months: Norfolk pines suffering from termite infestation were replaced with royal palms, new decorative lighting was added to the terraces, and landscaped roundabouts were put in place. At the same time, the Visitors' Center was upgraded with interactive kiosks and new displays. In December 2008, the Laie Hawaii Temple closed again for structural and seismic upgrades and to restore the ordinance rooms to their original appearance and progressive-style presentation of the endowment (still using film). The baptistry was repaired and renovated. The temple was rededicated on November 21, 2010, by Thomas S. Monson. LDS Church president Joseph F. Smith wanted the architecture of the Laie Hawaii Temple to resemble Solomon's Temple referred to in the biblical canon. The temple is often compared to the Cardston Alberta Temple, designed by young architects Hyrum Pope and Harold W. Burton. Pope and Burton's design was also used for Laie, and their work is rooted in the Prairie style architecture made popular by architect Frank Lloyd Wright in the early twentieth-century. The temples also evoke Mesoamerican architectural motifs, a favored theme of Burton's. The temple sits on an 11-acre (4.5 ha) site that was once part of a large sugarcane plantation. Construction of the temple first began in February 1916. Native materials consisting of crushed lava rock were used to build the temple, along with reinforced concrete. The building's gleaming white finish was created using pneumatic stone-cutting techniques. The temple has the shape of a cross when seen from the air; the highest point of the temple is 50 ft (15.2 m), and it measures 102 ft (31.1 m) from east to west and 78 ft (23.8 m) from north to south. The front exterior was designed in the form of a Greek cross, but lacks a tower, a rarity in LDS Church temples. Apart from the Laie Hawaii Temple, only three other church temples lack towers or spires: the Cardston Alberta, Paris France and the Mesa Arizona temples. The exterior of the temple exhibits four large friezes planned by American sculptor J. Leo Fairbanks and built with the help of his brother Avard Fairbanks. Modeled four-fifths lifesize and cast in concrete, the bas-relief friezes depict God’s dealings with Man. The north frieze depicts the story of the Book of Mormon. The west frieze shows the people of the Old Testament. The New Testament and the Apostasy are depicted on the southern frieze of the temple, and the restoration of the Church through Joseph Smith is shown on the east frieze. On the grounds of the temple are statues also designed by the Fairbanks brothers, including Joseph being blessed by his father and one of the Prophet Lehi in a scene from the Second Book of Nephi in the Book of Mormon. As visitors approach the temple and pass a number of reflecting pools, a maternity fountain sits in front of the uppermost pool. Designed by the Fairbanks brothers, this bold relief honors Hawaiian Motherhood and depicts a Hawaiian mother holding a giant clam shell while pouring water over her children. The act is supposed to symbolize mothers pouring their love, hope and care onto their children. The landscaped temple grounds contain tropical gardens, with plants such as hibiscus, Brazilian plume, birds of paradise, lantana, red ginger, bougainvillea, plumeria, Ixora, and others. At the base of the temple grounds is a fountain separating an LDS Family History Center and a Visitors' Center, where a ten-foot sculpture replica of Bertel Thorvaldsen's Christus stands inside the entrance. The Laie Hawaii Temple is 47,224 square feet (4,387.3 m2) and houses four ordinance rooms and six sealing rooms. Landscape artist LeConte Stewart designed many of the murals found inside the temple. Laie Hawaii Temple is not used for regular Sunday worship. As temples are considered sacred houses of the Lord, only church members who keep gospel covenants are allowed to enter for the purpose of participating in sacred ceremonies such as endowments, baptism for the dead and eternal marriage, a ritual in which couples and families are sealed for time and all eternity. Because of these guidelines, non-Mormons are not allowed inside temples, but public tours of the grounds outside and of the visitors' centers are available. Notable temple presidents include Edward L. Clissold (1936–38, 1943–44, 1963–65); D. Arthur Haycock (1986–89), and J. Richard Clarke (1998–2001). ^ Aikau, Hokulani K. (Winter 2008). "Resisting Exile in the Homeland: He Mo'olemo No Lā'ie". American Indian Quarterly. Lincoln, NE: University of Nebraska Press. 32 (1): 70–95. doi:10.1353/aiq.2008.0003. ISSN 0095-182X. ^ a b c Kayal, Michele (November 27, 2004). "Mormons Spruce Up Their Aging Hawaiian Outpost". The New York Times. Retrieved October 10, 2012. ^ "Temples renamed to uniform guidelines". Church News. Deseret News. October 16, 1999. Retrieved October 10, 2012. ^ Wallace III, William Kauaiwiulaokalani (January 30, 2000). "The Church of Jesus Christ of Latter-day Saints in the Hawaiian Islands from 1850–1900". History. La'ie Community Association. Archived from the original on November 12, 2007. Retrieved November 17, 2007. ^ BYU–H (2006). "The Destiny of La'ie" (PDF). Office of Planning, Institutional Research, Assessment and Testing. Brigham Young University–Hawaii. Retrieved October 10, 2012. ^ a b c d e Webb, T. D. (1993). "Profit and Prophecy: The Polynesian Cultural Center and La'ie's Recurrent Colonialism" (PDF). The Hawaiian Journal of History. Honolulu, Hawaii: Hawaiian Historical Society. 27: 127–150. ISSN 0440-5145. ^ a b c d e f Satterfield, Rick. "Laie Hawaii Temple". Temples of the Church of Jesus Christ of Latter-day Saints. LDSChurchTemples.com. Retrieved October 10, 2012. ^ a b Burlingame, Burl (April 2, 2004). "X Marks the Spot: Mormon temple a Laie landmark since 1919". Honolulu Star-Bulletin. Retrieved October 10, 2012. ^ a b c Baldridge, Kenneth W.; Lance D. Chase (2000). "The Purported December 7, 1941, Attack on the Hawai'i Temple". In Grant Underwood (ed.). Voyages of Faith: Explorations in Mormon Pacific History. Provo, Utah: Brigham Young University Press. pp. 165–190. ISBN 0-8425-2480-0. ^ Adamski, Mary (December 11, 2004). "Dedication is set for Laie project". Honolulu Star-Bulletin. Retrieved October 10, 2012. ^ Arrington, Leonard J.; Davis, Bitton (1992). The Mormon Experience: A History of the Latter-day Saints (2nd ed.). Champaign, IL: University of Illinois Press. p. 266. ISBN 0-252-06236-1. ^ Anderson, Paul L. (July 1977). "First of the Modern Temples". Ensign. Salt Lake City, Utah: LDS Church. Retrieved October 10, 2012. Anderson, Paul L. (2000). "A Jewel in the Gardens of Paradise: The Art and Architecture of the Hawaii Temple". BYU Studies. Provo, Utah: Brigham Young University. 39 (4): 170. Britsch, R. Lanier (1991). Moramona: The Mormons in Hawaii. Mormons in the Pacific series. Laie, Hawaii: Institute for Polynesian Studies. ISBN 0-939154-46-3. Budnick, Rich (2005). Hawaii's Forgotten History: 1900-1999: The Good...The Bad...The Embarrassing. Honolulu, Hawaii: Aloha Press. p. 46. ISBN 0-944081-04-5. Compton, Cynthia D. Woolley (December 2005). "The Making of the Ahupuaʻa of Lāʻie into a Gathering Place and Plantation: The Creation of an Alternative Space to Capitalism" (PDF). Ph. D. dissertation. Brigham Young University. Retrieved October 10, 2012. Fairbanks, Eugene F.; Fairbanks, Avard Tennyson (1998). A Sculptor's Testimony in Bronze and Stone: The Sacred Sculpture of Avard T. Fairbanks. Salt Lake City, Uta: Fairbanks Art and Books. ISBN 0-916095-58-4. Garrett, John (1992). Footsteps in the Sea: Christianity in Oceania to World War II. Narrative History of Christianity in the Pacific Islands. 2. Suva and Geneva: Institute of Pacific Studies, University of the South Pacific. World Council of Churches. ISBN 982-02-0068-7. Sterling, Elspeth P.; Summers, Catherine C. (1978). Sites of Oahu. Honolulu: Bishop Museum Press. pp. 155–160. ISBN 0-910240-73-6. Webb, Terry D. (2001). "The Temple and the Theme Park". In Joy Hendry & C. W. Watson (ed.). An Anthropology of Indirect Communication. [Association of Social Anthropologists Monographs 37]. London and New York: Routledge. pp. 128–142. ISBN 0-415-24744-6. Wikimedia Commons has media related to Laie Hawaii Temple.